Dolphins are in fact whales, and some whales are in fact dolphins. Dolphins belong to the class of whales, called Odontoceti which actually means "toothed whales". As the name suggest this species of whales have teeth and are predators, unlike the baleen whales that eat plankton. Within the group of toothed whales is the family called Delphinidae or oceanic dolphins. Some species that are commonly referred to as whales like the Orca (Killer Whale) or Pilot Whale are members of the Delphinidae family and are classified as dolphins. Size: Dolphins come in a variety of shapes and sizes. They can be as small as 4 feet long to 30 feet long (orca whales). Habitat: Dolphins can be found in all oceans and fresh water dolphins can be found in some of the world's largest rivers. Diet: Dolphins are predators they eat fish, squid, and crustaceans. Their diets can vary based on their environment and the available food sources. Senses: Dolphins have an acute sense of hearing. They have acute vision both in and out of the water. 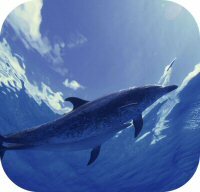 Dolphins have elastic lenses that expand and contract so they can see both above and below the water. A dolphin's sense of touch is well developed. A dolphin's skin has many nerve endings, and they are very sensitive to touch. On the other hand a dolphins has a limited sense of smell. Dolphins use a system of "radar" called echolocation for navigation. Description: Dolphins can vary in color, shape and size. A dolphin's skin feels like smooth and is often described as feeling like rubber. Communication: All species of Dolphins produce a series clicks and sounds that resemble whistles, moans, trills, grunts, and squeaks. They are able to communicate with their pod using different pitches and sounds. Orca Whales are actually dolphins. They are the largest species of dolphins growing up to 30 feet in length. Hunting: Most species of dolphins are highly social and often travel in groups called pods. They will often work as a group in order to coral fish and hunt. Gestation: Dolphins have long gestation periods and can carry their young 11 to 17 months depending on the species. Birth: All species of dolphins give birth to their calves tail first. They are the only mammal that gives birth tail first. The size of the dolphin's calf can vary depending on the species. Calves: Dolphins are known to form strong bonds between mother and calf. Sexual Maturity: Dolphins are very sexually active and often have multiple partners. Their can be fierce competition for breeding partners. Life Span: Dolphins can be afflicted with many diseases that are found in humans including: stomach ulcers, skin diseases, tumors, heart disease, urogenital disorders, and respiratory disorders. Some smaller species of dolphins have predators. All dolphins are sensitive to pollution and habitat destruction. Fishing nets can also result in the deaths of dolphins, as dolphins require air to breathe, if they become entrapped in a net they are unable to surface for air. Social Structure: Dolphins are highly social and travel in groups called pods. They form strong social bonds and have even been known to assist and support injured dolphins in their pods. They will also compete with each other and act aggressively in order to mate. Athleticism: Dolphins are effortless and efficient swimmers. Dolphins can swim up to five times faster than the fastest human Olympic swimmers. They can swim 25 mph for miles and with bursts of speed up to 35 mph. Unusual: Dolphins can voluntary breathers. They breathe when they are half sleep, during the sleeping cycle, one brain hemisphere remains active, while the other hemisphere shuts down. The active hemisphere controls the dolphin's surfacing and breathing behavior.